UniCentral offers a secured student housing complex with fabulous facilities, fully furnished and equipped Sunshine Coast student accommodation on the boundary of the University of the Sunshine Coast Campus. Just step outside your gate and onto the University Grounds. Enjoy spacious Sunshine Coast student accommodation at UniCentral. Each shared apartment offers four large lockable bedrooms each with a double bed, private ensuite bathroom, large study desk and chair, two wardrobes. Secure Internet connection and telephone access. Each apartment includes a fully equipped kitchen, a lounge area with a flat screen TV, 2 sofa's, coffee table and dining furniture. There is also a separate laundry off the kitchen with a free washing machine and clothes dryer. Outdoor furniture also supplied on either the balcony or courtyard. UniCentral's modern community facilities include a Six lane, 25 meter pool - flood-lit full size tennis/basketball court. A Recreation Pavilion surrounded by verandas overlooking the swimming pool and tennis court. The Pavilion has a large flat screen TV with Foxtel. Comfy lounge furniture, Pool Table, Table Tennis, Air Hockey. Food and Drink Vending Machines also available and a Central Barbeque area. There are undercover carport facilities for a small weekly fee and plenty of free secure parking within the grounds of UniCentral. Step outside the back gates directly onto the University grounds, a few minutes’ walk to class. 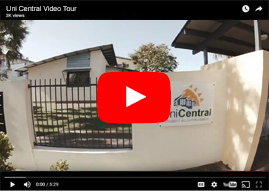 UniCentral is everything a Sunshine Coast Student Accommodation should be. Students feel secure knowing the Resident Managers live on site and security guards patrol the complex regularly at night.